Cube root is a number that must be multiplied times itself three times to equal a given number. Do you know the cube root of 39304? You can learn how to solve this and other cube roots very quickly using the steps below. Step 1: Memorize the cubes of each number from 1 to 10, especially the last digit. See the video below for a chart. Step 2: Look at the last digit of your number and write down the corresponding number. 4 in the case of 39304. Step 3: Now ignore the last three digits: 3 0 4. Step 4: Find the closest cube without going over. 39 is closest to cube of 3. That gives us the other part: 3. Step 5: Put the numbers together to get 34. 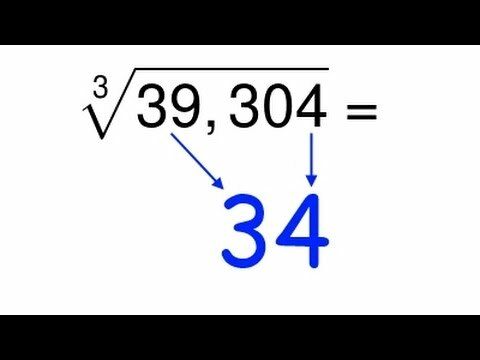 34 is the cube root of 39304. 34 * 34 * 34 = 39304.